I think it would look really awesome to paint the sides! Something closer to the same tone maybe? Eggplant purple or some sort of bluish green. I like colors that are weirdly the same but not. Very good question-- if something was already painted or in poor condition, I say go ahead and paint. If not, it might be better left alone. The problem, to me, is once you paint, sooner or later it's going to need more paint. 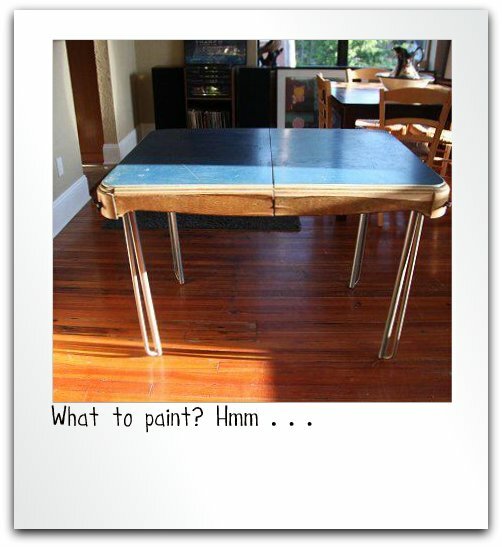 What about leaving the legs of your table as is and painting the top and sides black? Might make a statement. Or the sides a solid color and the top stripes?? You're going to get too many suggestions!! Good luck-- be sure to show us what you end up doing. I'll definitely follow-up with the end result. Always tricky to pick the right finish. I think I'll have to end up painting the legs, for some reason it doesn't show in the photo but they're very rusty and it doesn't look good on that style of leg. Oh, and that's another good point on the longevity of your damaged finds when you paint them? How long before you have to paint them again? It's worth looking into. I just tried to post a comment and my browser did something weird and the comment disappeared, so I apologize if I am double posting... Have you tried simichrome on the rust? It's great. I haven't. Thanks for sharing that, I will definitely experiment with that! I would do the simichrome on the legs, because paint might be a pain to get to stick. The top would be super cool in mint green (hipsters dig that color) or my fav, aqua. If you didn't sell it, I can't wait to see how it turns out. I'm leaning toward the mint green, lots of suggestions for and like you said, it sells! Thanks Michelle for the link- I bookmarked it, since I have a lot of chrome that I would like to restore! I just appreciate the wealth of know how that is available through the internet. I had French provincial furniture that I hated but if I had painted it (the hubby wouldn't consider it, painting wood? Blasphemy! )I would have loved it. Now that I don't have it, I wish I did, so I understand the slippery slope of leaving a piece alone and following your own desires. I like your mint green and yellow choice, if the chrome can't be saved. Thank yee for the feedback. :) Yeh...it does feel blasphemous to paint finds, I only do it in rare instances. I want something bright that makes it stand out, like orange or yellow. It sound like everyone is on the same page re. color. You've totally inspired me to do more with finds besides cleaning. I have now moved to repairing! I know, I know. So lame. But now I'm willing to purchase things that need a little love because I have the energy to fix 'em, sew things, glue things, etc. Enjoy it, it's so fun! I happen to have orange and yellow on hand so a side table I want to re-paint may get the bright treatment. :) That's my personal favorite for furniture. I'm addicted to upcycling, lots more posts on it are comin' up. I don't alter my thrifted items, mainly because I wouldn't know how, nor do I want to hold onto something even longer just to see if it will sell. I like to move older items out to make room for newer items and keep my inventory fresh. But hey, if you have the inclination, go for it. I love seeing things transformed and given new life. I think it looks pretty good in the photo. Don't they make metallic silver paint! I think I've used it before so I'm pretty sure they do. I'd touch up the rusty legs with that and maybe the sides as well and leave the top that nice blue. Then I'd go out for a beer. Thanks for stopping by my blog! Thanks for the suggestions! I'd attempt to sell it as is but the photo is deceptive, the sides are feeling off in addition to the rusty legs. I may try the lightest of touch-ups though first, you never know if that's all it will need to sell. Have you considered chalkboard paint for the top? I think that would add a fun function to the table. Not a bad idea, thanks for the suggestion. Hmm..